This LibGuide will provide information for Arts & Humanities. You will find links to helpful article databases and websites, as well as books in the library and ebooks available to you online. Use the tabs above to navigate this LibGuide. New! 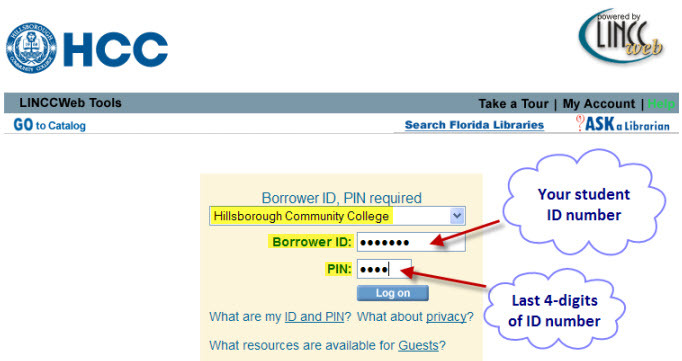 Connect to HCC Libraries Online via Canvas, no separate log-in required. Find out how. Your "Borrower ID" is your 7-digit student ID# (or employee ID#) on your Hawk Card. Input the last 4 digits of your ID# for the PIN. Looks like this. For example, if your ID# were 0456789, your PIN would be 6789. To change your PIN access “My Account”. Click “PIN” to change it. Having trouble logging in? Contact an HCC campus library.